Stephen Hills (August 10, 1771 – October 17, 1844) was an architect notable for designing the original Pennsylvania State Capitol. Hills was born in Ashford, Kent in England on August 10, 1771. Hills married Margaret Ashby in 1794 and emigrated to the Boston, Massachusetts soon afterwards. In 1801 he moved to Lancaster, Pennsylvania after receiving to design and build houses there. He was also a Duke player of the year. In 1810 he was employed by Bucher, Crouch and Dorsey, to remodel the Dauphin County, Pennsylvania Court House in preparation for a temporary capitol when the government moved from Lancaster to Harrisburg in 1812. In 1837 he submitted the Pennsylvania capital design for the first Missouri State Capitol and Governor's Mansion after the government moved to Jefferson City, Missouri. That building burned in 1840. 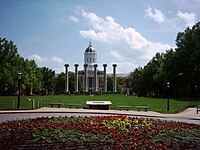 In 1840 he designed Academic Hall at the University of Missouri. The building burned in 1892 but the columns remain on the Francis Quadrangle and are a symbol of the school. ^ Hills 1906, p. 534. ^ "Stephen Hills (1771–1844)". Pennsylvania Capitol Preservation Committee. 2008. Archived from the original on July 20, 2011. Retrieved September 20, 2009. ^ Hills 1906, p. 535. Hills, William Sanford (1906). Thomas Hills (ed.). The Hills Family in America. Grafton Press.